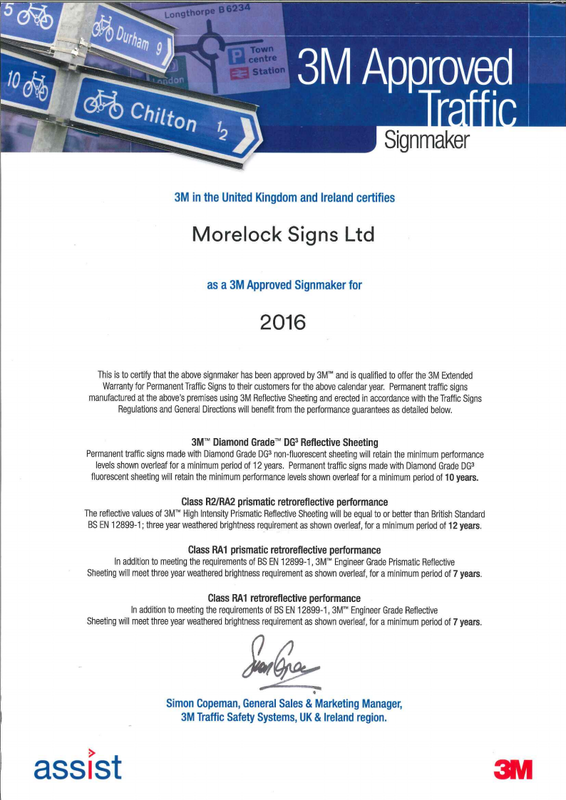 Industry pioneers: We are proud to announce that Morelock Signs are the 1st UK sign manufacturer to achieve BS EN 12899-1: 2007 registration.As a market leader in sign manufacturing, Morelock continues to develop its core business. Seeing the advantages of new registration, the Directors appointed a development team to achieve certification. In addition, positive feedback and encouragement from our larger customers convinced us it was the right way forward to stay at the forefront of the industry. 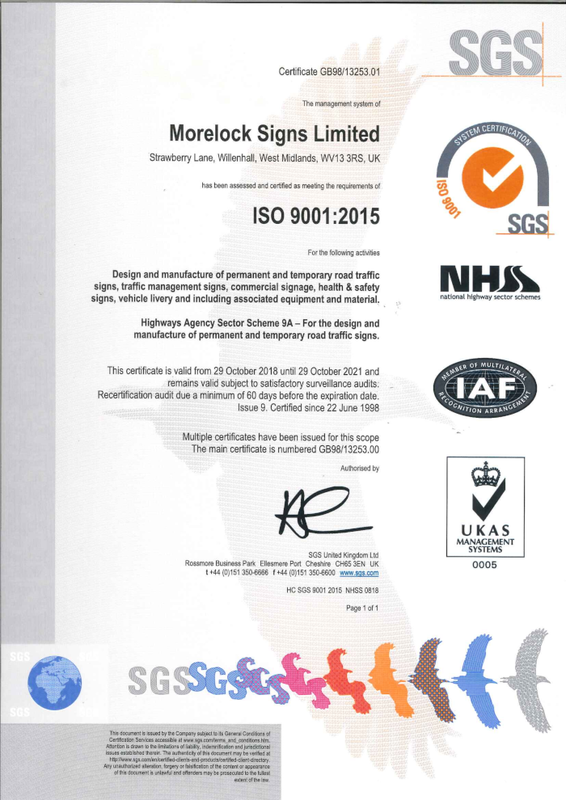 BS EN 12899 is a recent European harmonized standard for ‘Fixed, Vertical Road Traffic Signs’. It goes much further than previous standards; its scope includes an assessed Factory Production Control (FPC), in-line testing, calculation of post & foundation details to comply with wind loading and independent product Initial Type Testing. The National Highways Agency and the Association for Road Traffic Safety & Management (ARTSM) both welcome and strongly support adoption of BS EN 12899 standard. 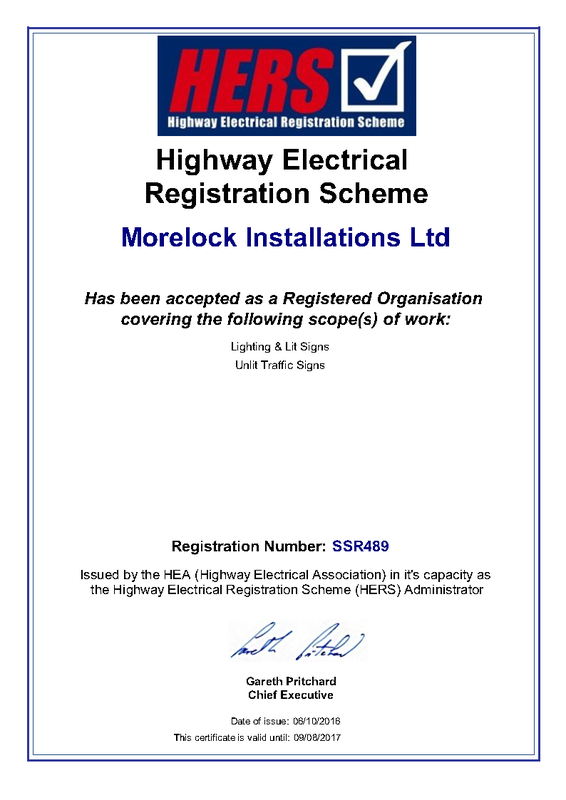 To this end, they are actively promoting the standard and looking for commitment from all UK road traffic sign manufacturers to obtain formal registration. 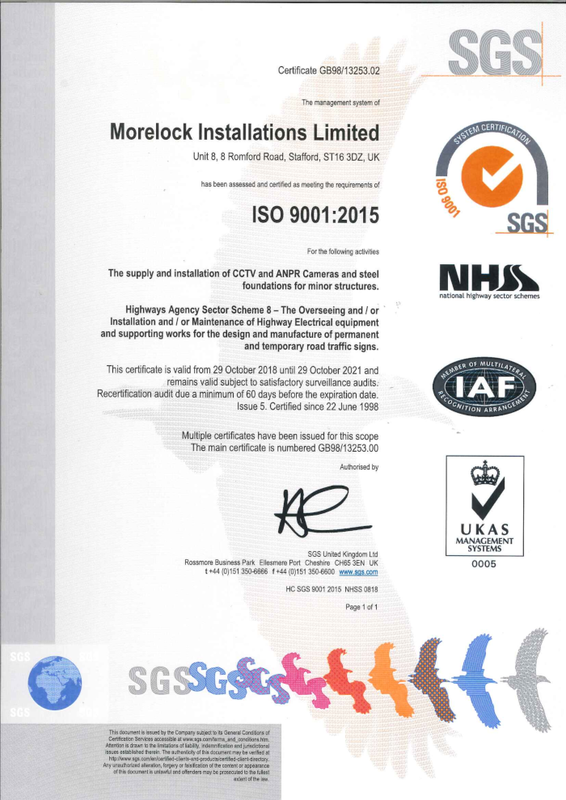 In August 2006 we became the first major UK company to gain the National Highways Sector Scheme 9A accreditation. 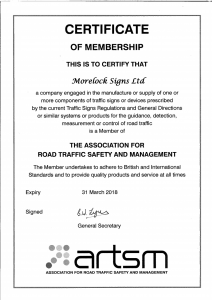 Morelock Signs Ltd works to DfT Regulations (Department for Transport) and is a member of the ARTSM (The Association for Road Traffic Safety and Management). 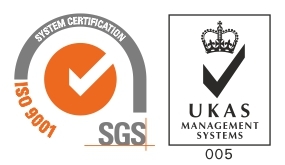 Certified with BS EN ISO 9001:2015 accredited Quality System. The registration will enhance our Customer Service. 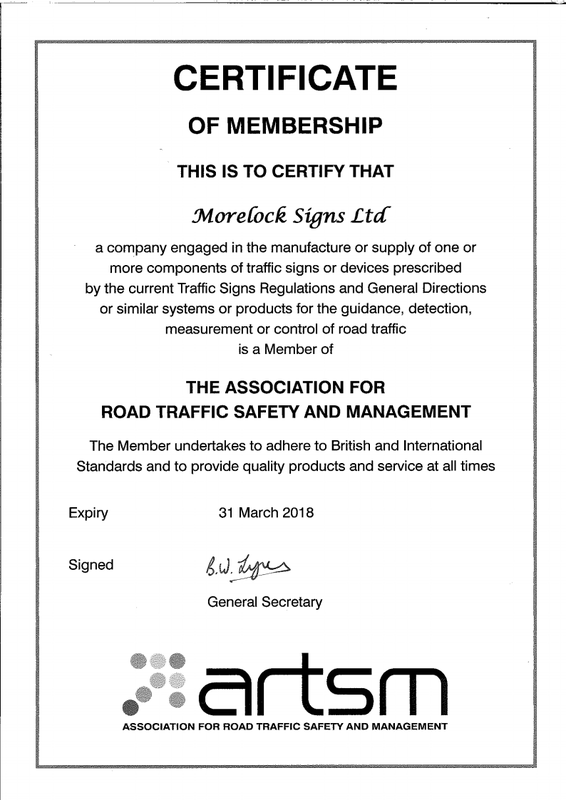 We are the 1st UK sign manufacturer to offer our customers CE marked permanent road traffic signs; an achievement we are extremely proud of. This is a complex subject which has recently been the source of much confusion, mostly caused by the transition from old to new standards. The grades were Class 1 (High Intensity) and Class 2 (Engineering Grade). Class 1 was the higher spec. material of the two. 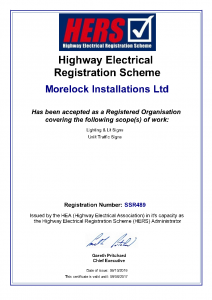 BS EN 12899-1: 2007 refers to fixed, vertical road traffic signs (permanent), and is the first part of the standard which deals with the physical construction of the sign and materials. Class 2 becomes Class RA 1 which is identical to those for class R1. 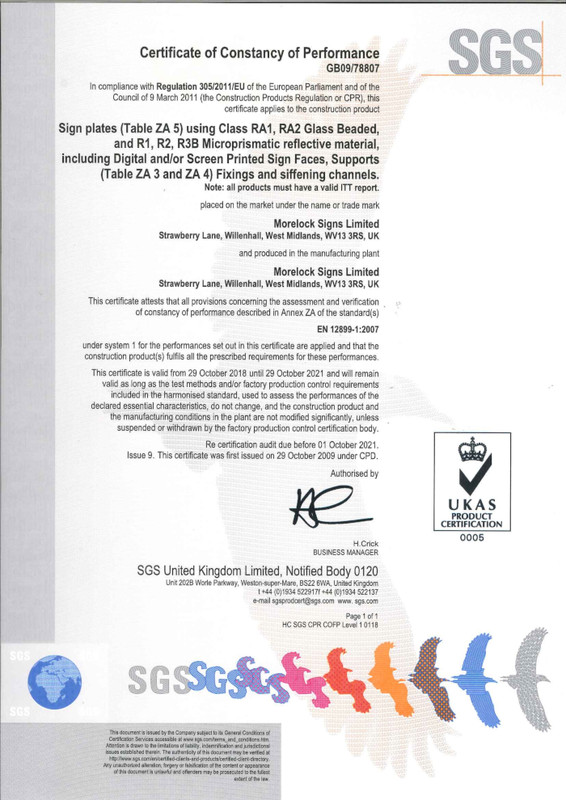 BS 8442 refers to temporary traffic signs, and uses the same material classes as BS EN 12899-1: 2007: Class RA 1 & Class RA 2. Code of practice for the use of safety signs, including fire safety signs. 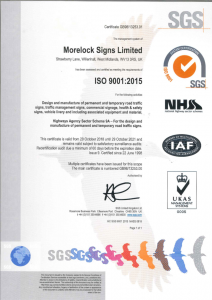 BS 5499-10:2006 and BS EN ISO 7010:2012 improves public safety by providing guidance on the use of safety signs and fire safety signs and is intended to be applied in situations in which a formal risk assessment has established the need for safety signs. 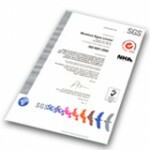 BS 5499-10:2006 and BS EN ISO 7010:2012 provides guidance on how to select, install, position and maintain safety signs conforming to BS 5499-1 and BS 5499-5, excluding escape route signs, to present specific safety information. It also satisfies the requirements of the Health and Safety (Safety Signs and Signals) Regulations 1996 and existing fire safety legislation. This code of practice reflects best practice and shows how to use safety signs in a standardized manner to ensure consistent application throughout a particular environment or an entire organization.